Sealing the Deal: The Love Mentor’s Guide to Lasting Love, Dr. Diana Kirschner is a relationship advice type of book. The new relationship advice book asks: What if it were possible to transform a painful relationship and the anxiety of an unknown romantic future into a committed and “forever” love? To feel chosen, secure and appreciated by The One you really want? The good news is, you can! You can deepen any relationship—even if you have been dating two months, on & off for 10 years, or in any relationship where you feel uncertain, tense, or afraid that it is ending. Even if your partner has cheated. Sealing the Deal: The Love Mentor’s Guide to Lasting Love shows you exactly how to do just that and create a loving, lasting relationship–your own happiest-ever-after. 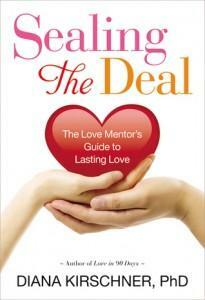 "Win a copy of Sealing the Deal: The Love Mentor's Guide to Lasting! @kimmie_1980 http://tinyurl.com/46t9aty (02/27) #giveaway"
***Giveaway ends February 27th @ 11:59 ET!!!! I follow on GFC! email in my profile. I voted for you on "Were on the fence"
I voted for you on "Olah Momma"